Following her debut hit "Gee Whiz (Look At His Eyes)" and its accompanying album in 1961, there was a four year period which saw no new Carla Thomas albums, only singles. 1966 remedied this by seeing the release of two new albums, first Comfort Me and then Carla later in the year. By now she was on the Stax label proper, rather than Atlantic. 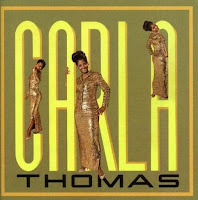 Carla featured a great collection of tunes with the recognisable Stax R&B sound, with backing from Booker T & The MGs and The Memphis Horns. It included a number of country and pop songs given Stax makeovers, among them Hank Williams' "I'm So Lonesome I Could Cry", Patsy Cline's "I Fall To Pieces" and Dusty Springfield's "You Don't Have To Say You Love Me", and blues tunes such as Willie Dixon's "Red Rooster" and Jimmy Reed's "Baby What You Want Me To Do". It also featured two great new songs from the songwriting partnership of Isaac Hayes and David Porter, both of which were released as singles and became hits. "Let Me Be Good To You" charted at #11 R&B, and then "B-A-B-Y" reached #3 R&B and #14 pop, becoming her new signature tune and her biggest hit as a solo artist.